One of the things that makes it especially hard to live so far away from family is that Edie doesn’t get the constant interaction with her grandparents, aunts, uncles and cousins. 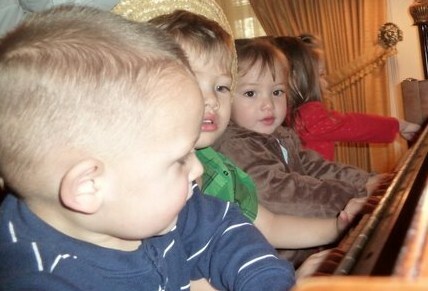 Factor in that there are 3 cousins in Boise that are within 12 months of her age, and 2 additional pre-teen cousins who enjoy entertaining the little ones – and you can see how we wish Edie could participate in the family melee more often. Typically, we travel to Boise to celebrate Christmas. However, for the first time in nearly 10 years, we chose to make an early December trip to Boise and stay home for the holidays. Though there are pros and cons to either choice of trip, one huge pro was being able to be in town when my Great-Aunt M and her daughter, C, were also visiting. 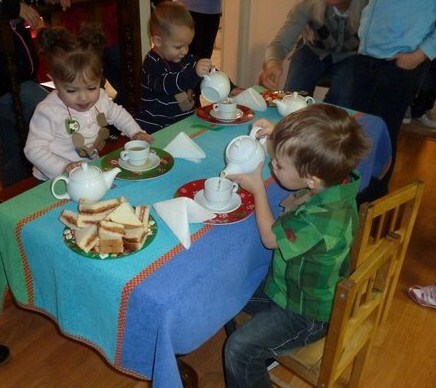 This led to a unique opportunity to have a family tea party, and most notably, a toddler tea party. Aunt S went above and beyond in creating the perfect environment for the kids. Her background as a preschool teacher and now working in children’s speech therapy, in addition to her incredibly creative mind and artistic skill… well you just can’t beat her. A kid’s sized table was covered in colorful beach towels to create an absorbent and bright table cloth. A plate stacked with tiny triangular peanut butter and jelly sandwiches sat next to a platter full of pear halves topped with maraschino cherries. But the piece de resistance was the small white tea pot and tea cup at each place. The tea pot was filled halfway with apple juice. Yes, it was a lovely lunch for the tots, but they were much more interested in pouring the juice from the tea pot into the cup, then lifting the lid off the pot and pouring the juice back in – just as my Aunt knew they would. Back and forth, they poured and poured. A few sips were taken here and there. R, at one point, decided the tea pot spout was a fun way to take a drink, and that delighted the other kids to no end! Watching the kids have their fun and enjoy the eating and the playing was a great way to wrap up a year of precious tea moments. 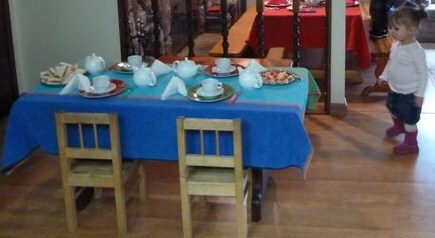 It also reminded me that tea with friends or family doesn’t have to be extravagant, formal or lacy. It can be simple and fun and still be absolutely beautiful. 1 can of pear halves in lite syrup. Drain the pear halves, set on a plate and place 1 maraschino cherry in the hollow of each pear half. Or, to make things even easier, substitute a can of fruit cocktail, drain completely and serve in decorative bowl. The small pieces are just the right size for little hands. 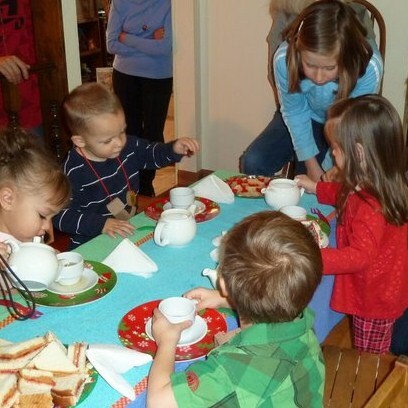 Provide small teapots and cups for the toddlers. I found small white teapots on Amazon.com for around $6 each. Use apple juice (dilute apple juice by using 2 parts apple juice and 1 part water), instead of tea. While a plastic table cloth is great for protecting your table, using large beach towels over the plastic cloth is a bright and easy way to reduce spill issues. It’s a New Year! May 2011 bring you many precious tea moment with those you love the most! This is SO adorable! The towel-as-table-cloth is darling too. Love all the pictures! Thanks – I don’t know who had more fun: the kids or all of us who were watching the kids!